Mumbai is India’s financial and commercial capital, home to over 18.5 million people packed into just over 233 square miles (603 square kilometers). India has seen incredible growth in its GDP since the economic reforms of 1991, with economic growth often above 9% annually over the past 27 years. 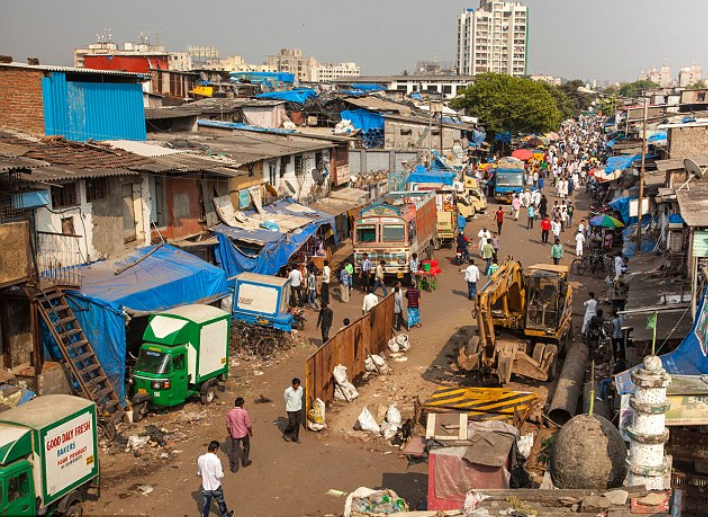 Because of this massive growth, Mumbai has become known as a city of both immense wealth and poverty. While the city has seen some of the most expensive real estate transactions in the world, it arguably houses the most slum dwellers of any city globally. As land values rise within Mumbai, developers have begun to find creative ways to redevelop Dharavi, a slum with a “goldmine” location. Dharavi, located approximately 12 miles (20km) from the city, was once well outside the center of commercial, residential and industrial activity. Founded in 1883, Dharavi grew as polluting factories moved out and rural Indians migrated to Mumbai in search of jobs. Nearly all of the land Dharavi was built on is considered public land, but individuals continued to build tiny shacks to live and work in, with the government turning a blind eye. Tanneries, potteries, garment makers, and recycling facilities sprung up within Dharavi as the slum grew, but there was no government plan to invest in any infrastructure. Today, the city has a population estimated between 600,000 to 1 million people living in a total area of approximately 0.84 square miles (2.17 km). The city also has an informal estimated GDP of close to $1 billion. prices up to Rs 10 lakh ($9,300) on the market. Rents for the same sized shack have reached the point of approximately Rs 5,000 ($75) per month. While these prices may seem attractive compared to places like Manhattan, most households in the slum do not bring in more than Rs 15,000 ($230) a month. While prices are high in Dharavi, the rents in the city center of Mumbai are much higher, demonstrating just how valuable the land is. Not surprisingly, developers and the government have begun looking at ways to redevelop the area to capture the value of the land. To do this, creative ways need to be found to house the hundreds of thousands of current residents. The current plan was put forth by American-trained architect Mukesh Mehta. His plan, accepted by the government in 2004, revolved around the idea of increasing the floor-space index of Dharavi from 1.33 to 4, thereby concentrating current residents into towers. Any current resident of Dharavi that can prove residency since 2000 would be provided a new, 355 square foot (33-square meter) home for free. In return, the additional space would be used for luxury high rises that will deliver large financial returns. This model, which would finally introduce basic sanitation, electricity, and clean water to the area, was viewed as a win-win. While Mehta’s proposal was accepted in 2004, the past 14 years have seen the redevelopment plans remain in the planning stages. The largest obstacle has been massive opposition from current residents who feel the proposed amount of space is simply not enough. There is also no clearly defined space planned for all the current “informal” businesses in place, raising fears from within the slum that their sources of income would be shut down. Another issue has been the slow nature of finding a builder for the redevelopment. It was not until 2006 that the government issued ‘Expression of Interest’ documents to invite global tenders, and in 2008 an expert consultant hired by the government found the tendering process to be defective. It took three years for the government to come up with a new global tendering process which resulted in the cancellation of existing bids to build the project. In 2016 the government finally approved new tender documents. Unfortunately, no bids came through in 2016 to build all 178 hectares of the slum, as the scope of the Rs 22,000 crore (almost $3.8 billion) project appeared to be too much for construction companies. To address the grievances of slum dwellers, the city and state governments invited ideas from the global community. Mumbai’s Urban Design Research Institute (UDRI), an independent organization advocating for more equitable development in its home city, launched an international competition in 2016, called Reinventing Dharavi, to solicit the best ideas to address the issue. The winning proposal, inspired by Ghandi’s notion of land as a community inheritance, brought about the idea of creating a Dharavi Community Land Trust. In order for this to work, all current landowners, including the government, need to release ownership rights to a trust that is governed by former landowners, community members and neighborhood associations. This method allows the community to have a voice in the future of its land, while also solving land ownership issues that have slowed down the project. Currently, UDRI is developing a publication to best structure this proposal to government officials. After attracting no bidders for the tenders of the project in 2016, the government decided to subdivide the project. Initially, the project was split into five tenders with a builder expected to be in charge of one portion. Now, the government has decided to split the project into 14 “sub-clusters.” Each cluster will have its own tender, allowing builders to bid separately. The builders will need to rehouse the existing slum dwellers in its sub sector, as well as create infrastructure such as roads and utilities. By creating smaller projects, the government hopes to entice interest from builders that were otherwise too cash strapped to bid. While slowdowns in redeveloping Dharavi thus far appear to be discouraging, there is precedent of a successful slum redevelopment in India. In Pune, just a two-hour drive east of Mumbai, a remarkable five-year transformation took place within the slum known as Yerwada, which houses approximately 337,000 people in an area of less than 31 square miles. 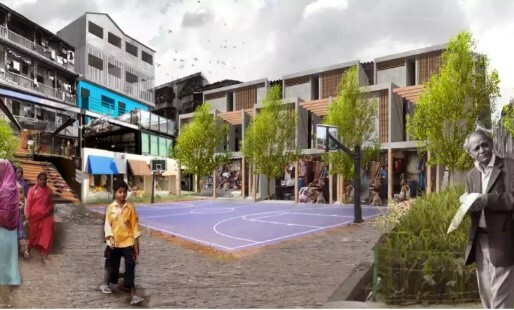 The project was considered a success because, unlike most slum redevelopments, it improved the area without razing it and relocating the residents elsewhere, consistently keeping the residents engaged. For example, the developers kept the mahila mandal, or local women’s group, as a key player in almost every aspect of the project. They also held community meetings, which allowed the public to incorporate their suggestions into designing the project. The residents also identified skilled laborers, such as carpenters and masons, whose services were used in the construction process. The procurement of local labor also reduced the overall costs, while increasing public participation and the community’s ownership of the project. As a result, when developers asked local residents to come up with Rs 30,000 ($480) per house to cover about 10% of the costs, the beneficiaries gladly did so, as they had developed a sense of pride because their efforts had gone into creating the project. While Dharavi is smaller and more populated than Yerwada, the project’s success demonstrates that there is a precedent of the residents working with developers to redevelop a slum community. Within Dharavi, property transactions are becoming more common, as rents and real estate prices begin to rise. As a result, there is a pressing need to formalize physical infrastructure and land ownership within the slums. Unfortunately, solving the issues that stem from rehousing millions of slum dwellers has proven to be a tougher task than expected. While the project is clearly taking steps to leave the planning phases, it is yet to be seen whether all stakeholders will align their support behind current redevelopment efforts.